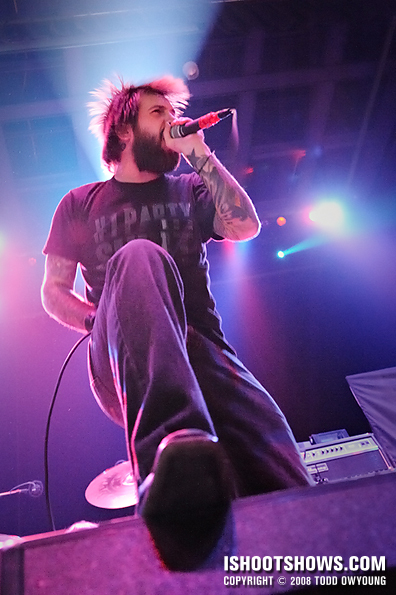 Opening for Killswitch Engage and Dillinger Escape Plan, Buffalo's Every Time I Die laid down a tight set of their signature blend of metalcore and Southern metal at the Pageant. 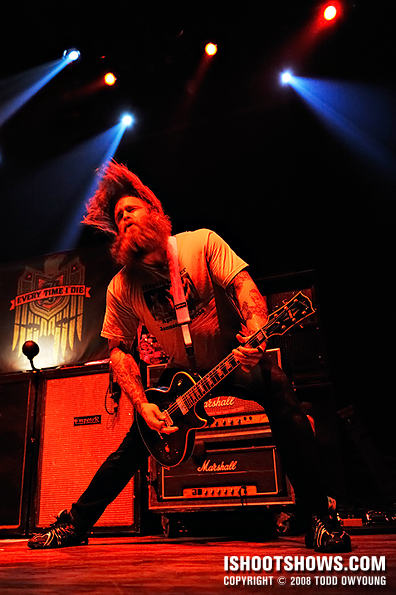 Chugging guitars, growling vocals, and a big, splashy drumming rounded out the band's sound for a tight, head-banging good time. 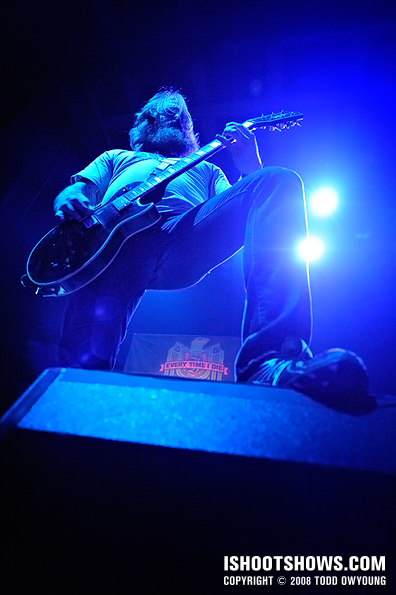 Keith Buckley on vocals delivered an energetic performance that had the frontman going up on the monitors at every opportunity, whether he was doubled over screaming or throwing his fists into the air. 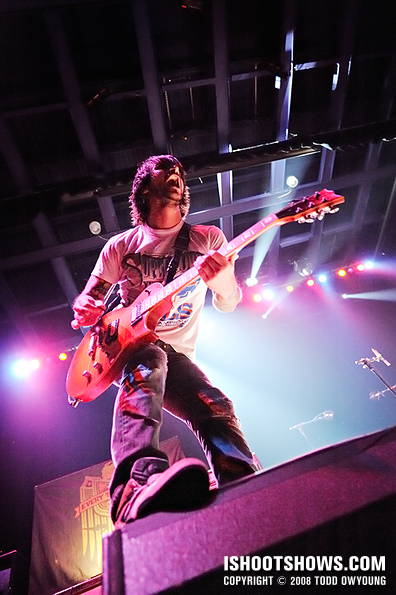 Keith's brother, Jordan, and Andy Williams brought the two-guitar attack, while Josh Newton on bass and Mike Novak on drums laid the foundation. 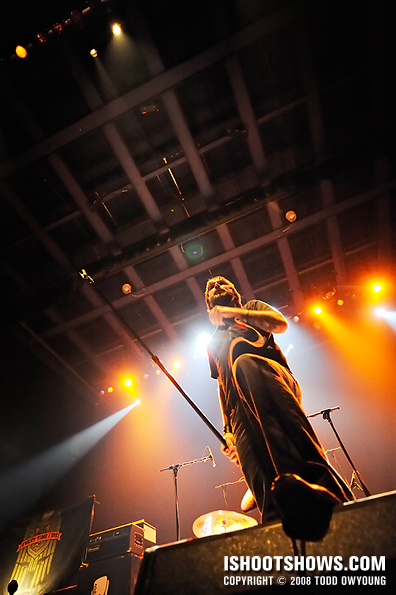 In a tight, 35-minute set, the band ripped through a ferocious set that drew most notably from their 2007 release, The Big Dirty (Ferret Music). This was definitely a tough set to photograph, but easier than the night's openers, Australian metalcore band Parkway Drive. Lighting for this set was relatively dim and took the form of explosive backlighting with relatively little light from the front. There were basically four lighting schemes used during the first three songs. The first was a uniform flood of deep blue light from the front and back. Next, there was a mix of magenta, yellow, and orange from the back of the stage. The third scheme was bursts of white light from the back mixed with deep magenta. Finally, there was a dull wash of alternating red and blue from behind while a high, white lighting filled in from the front. Overall, the lighting changes were very fast and matched the brutal pace of the music. I started out this set with the Nikon 14-24mm f/2.8, which was very useful for a lot of the wide, dramatic angles that seemed to work well for the stage-front positions many of the performers took. Into the second song, I switched to the Nikon 24-70mm f/2.8 to pick up a slightly longer perspective, but ended up going to 24mm a lo. 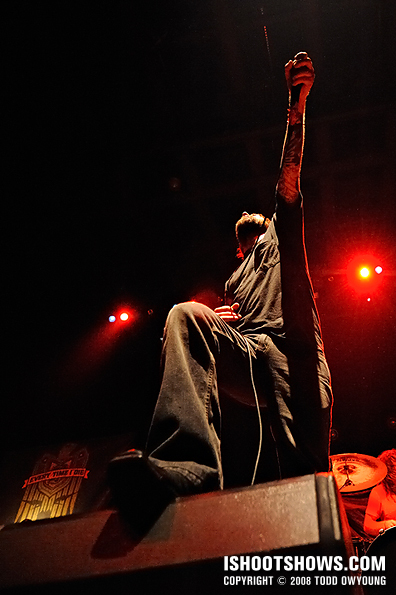 One thing I found for these metalcore bands is that the wide angle (30mm and below) were most useful for capturing the performers, who frequently went up on the speaker monitors. 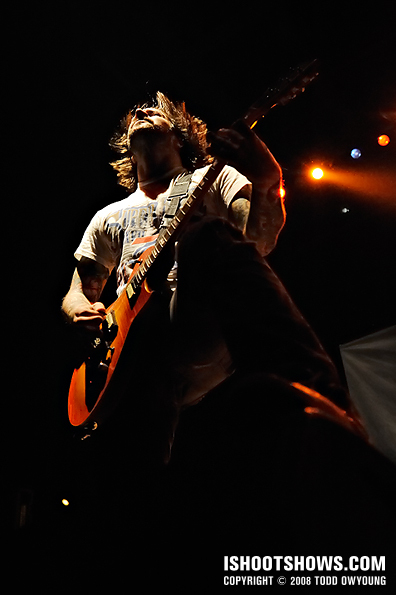 The dramatic angles and ability to capture the active performances of the band members kept me zoom out for this gig. I shot at ISO 6400 and f/2.8 for this entire set, but the shutter speeds were all over the board. During the start of the set with its very dull blue wash, light levels were dim and I shot at 1/125 until things brightened up. At the darkest part of the set, I shot at 1/50, and moved up 1/250 during the brightest portions of the performance. 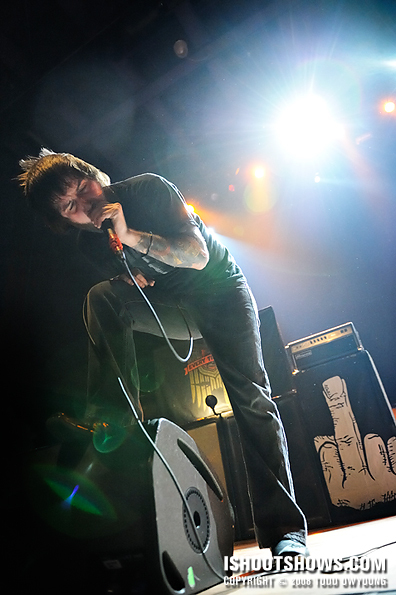 One thing I'd like to experiment with, given the chance, is a little off-camera flash with bands like Every Time I die. Considering the challenging lighting conditions, I think a little flash could produce some really nice results with the deeply colored lighting used for the set. In the lead image, this is one example of catchflash and an “off camera” flash. The source is simply the flash from someone's point-and-shoot camera in the crowd, which fired while the shutter was open for the relatively slow speed of 1/60. This was enough to provide a nice bit of fill to singer Keith Buckley and his brother Jordan while still maintaining a nice mix with the ambient lighting. With an off-camera flash, I think it would be possible to produce some great effects without the serendipitous need for the kindness of a stranger. Wow, the lighting for these metalcore bands has looked really rough. I can’t imagine what these would have been like on the D2x…seriously. Yeah, it was pretty brutal, even with ISO 6400. The blue washes in this set were really much darker than they appear here. With the D2x, I would have been shooting at ISO 1600 and praying at 1/30 of a second. The more explosive lighting would have been fine, but D3 or not, it was rough. I think I’ve had my fill of lead singers doubled over and screaming into a mic in complete darkness for at least a while. I’m ready for the soft jams for a change. 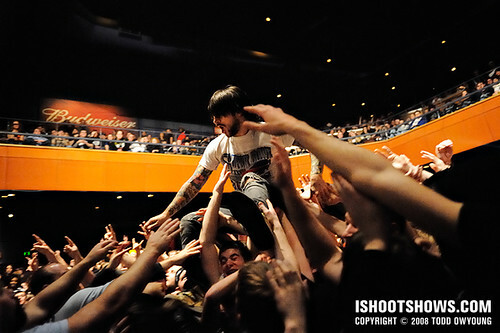 Out of all your photos from that show, I have to say that these ETID shots are my favorite. I especially dig the one of the drummer with the sound snake in the foreground. Thanks, Matt. 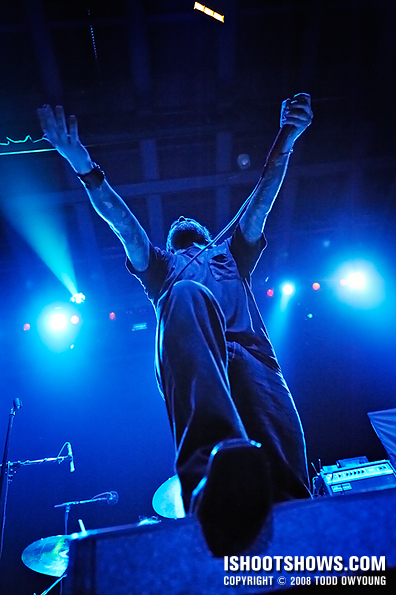 I think that overall, ETID had the most dynamic lighting, especially with the bright blasts of white light during their set. 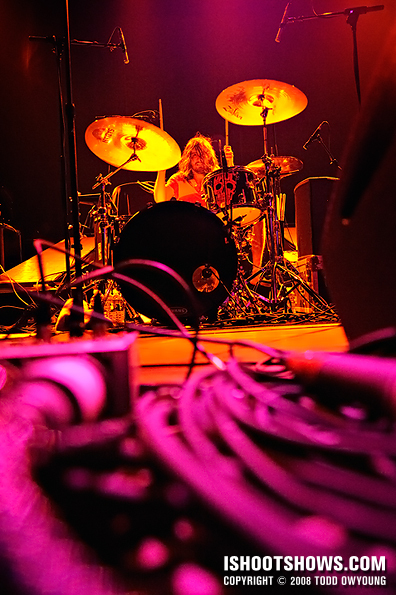 There were a lot of speaker monitors on the stage, along with lots of other junk, so I tried to incorporate that stuff into the shot of the drummer. Glad to hear it works for you — I think the two-tone lighting set it off. take 5 minutes of ur time and check out my latest LIVE/DJ SET serie please ! Thanks, G. I’ll check out your new set — I had a peek already and saw it was Goldie, that sounds like a great show. No worries about ISO 1600, I don’t care that much about noise/grain in an image. I’m a fan of grainy b&w film anyway. I wanted to go to this concert sooo bad, but I don’t drive and I live in Rolla. 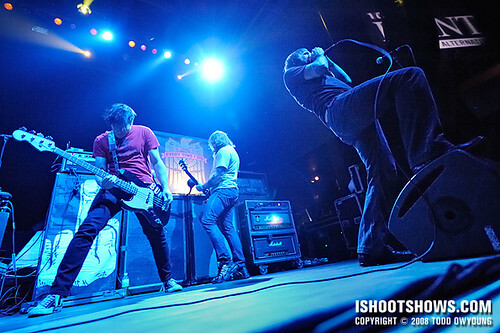 I love all of the bands that were on this tour. All of them except KSE had put out albums in 2007 (KSE released “As Daylight Dies in November of 2006, which was exceptionally great), and all the albums were extremely good. Hey Travis. Though I’m not that familiar with this scene or the music, I thought it was a really solid line up with great performances by all four acts. Dillinger Escape Plan has been around for a while so I was interested in seeing their live performance, but the other acts all put on a great show as well. As usual your pictures are redunkulous. Thanks, Zach. You actually picked out one of my favorite shots from this set. He was going crazy head banging and the even his beard was flipping out.